The tags feature should show you a few past reviews; I am loath to give away anything if you haven't started from the beginning. Start at the beginning! Suffice to say that The Bitter Kingdom by Rae Carson (HarperCollins - Greenwillow Books) wraps up the series in spectacular fashion. 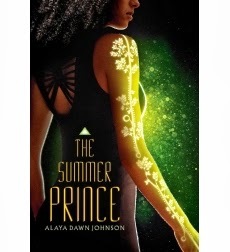 The Summer Prince by Alaya Dawn Johnson (Scholastic - Arthur A. Levine) marks the first of my 2013 Cybils (short, spoiler-free) reviews. I've been saving up this review because, well, this is a hard book to put into a review without spoiling it, even just as an opening summary. In a far, far future Brazil, in Palmares Tres, a sort-of enclosed city ruled with a heavy hand by its matriarchy, June is caught up in the cycle of the Summer Prince, the selection of men and boys who are political and social sacrifices. Enki wins over June and her best friend, Gil--and inspires June to greater artistic heights than ever before.